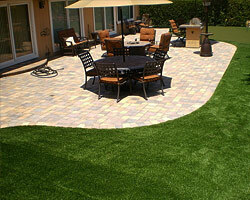 When thinking of moving the life outdoors, a patio is one of the best options for your needs. Patios allow you to enjoy the outdoors in an indoor-like environment. It's a place where you can relax, entertain friends, throw a party, play, cook and dine, and many more. Another wonderful thing about patios is their versatility. They can be designed into any shape and using any material that conforms to your own aesthetic preferences. They can be as large or as small as your space allows. They can be decorated or added with just any special touches, such as a Jacuzzi, a sound system, a small fountain, dining tables and chairs, or a fireplace. Serving Pleasanton, Livermore, Dublin, San Ramon, Danville, Blackhawk, San Jose, San Francisco, San Mateo, Palo Alto, Silicon Valley and neighboring cities in CA. Forever Greens has been helping California homeowners transform their properties into tangible expressions of their dreams for many years. Our company consists of master craftsmen and creative designers, and, together, we will work to build your perfect outdoor living space, a patio that combines functionality and elegance.